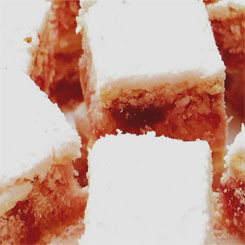 Folks, you really must make a batch of these, we used walnuts but you can make them without anything on top, with almonds or even a little dollop of your favourite jam. I reckon these are going to become very popular. Makes 2 dozen large short bread bisciuts. Walnuts, cherries or whatever you are going to top them off with. In a large mixing bowl, add the butter and then pop it into the microwave for about 30 seconds or so. You want it to be soft enough to beat with an electric beater. Add the icing sugar and beat it very well on high for about 5 minutes until it becomes very pale and creamy, almost white. No toss in the flour and baking powder in 3 portions mixing after each addition. Thats it, now all you need to do is form little balls of the mixture, roll them gently in your hand (yes round balls), place them on your baking sheet, press a little hole in the top with your finger and fill the hole with a nut, a lttle jam or even a piece of chocolate. Pop them in the oven for about 7-10 minutes and then turn off the oven and leave them inside for another 15-20 minutes. If you notice some of them browning on top you can open the oven to let out some of the heat and close it up again. We made batches that were very pale that melt in your mouth and also had some browned ones that were more like biscuits with a bit of a crunch that I must confess I enjoyed even more. Remove them from the oven and allow to cool before covering with a generous amount of icing sugar. Forget every scone recipe you’ve ever read. This is the only one you’ll need! (Makes 12 – 15 scones) Recipe by Rozanne. When these came out of the oven I left my office and drove over to try them. It was worth every second in the traffic. They truly are fantastic, this is one of those recipes your children will be asking you to leave them in your will! Preheat the oven to 220 degrees Celsius and make sure the oven tray is in the middle of the oven. Prepare two baking trays by lining them with baking paper. Cut the butter into blocks and rub into the flour mixture with your finger tips. The mixture should look just like bread crumbs. Make sure there are no lumps of butter at all. Turn the dough out onto a floured surface and knead very gently until a ball is formed. Pat the dough out with your fingers until it is about 3 cm thick. Cut out the scones using a round, metal cutter and place onto the baking trays (leave 2 to 3 cm between each scone). 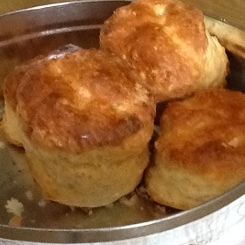 With the remaining egg, whisk it up lightly and brush a bit on top of each scone. Bake in the oven for 15 minutes. Always cut one open to check if they are completely cooked through, if not, immediately put them back in the oven for another 3 minutes. A lot of people tend to replace butter with margarine when baking because it’s a lot cheaper. NEVER do this when making scones. There is a huge difference between a delicious, light and fluffy butter scone and a horrible margarine scone. Scones are not scones if they are not made with buttermilk. It is abominable to own such recipes. Tear them up. Now!!!! Don’t ever forget to glaze your scones with egg before you bake them. The gloriously golden top is the best part. Always serve your scones warm with butter, jam and a generous dollop of freshly whipped cream. Scrumptious! When warming, NEVER put them in the microwave because they will go stodgy. Rather do it in the oven. It takes a bit longer, but definitely worth the wait! Your scones are perfectly cooked when the sound hollow if you tap the bottom. First put your shelf in the middle of the oven, heat to 210 Celsius and line 2 baking trays with baking paper. In a large bowl add the butter and the caster sugar. Beat with an electric beater for about 3 minutes until the mixture is pale and smooth and the sugar almost completely dissolved. Now add the milk and vanilla essence and beat for another minute or so to combine well. Now add the flour and custard powder and with a spatula or knife use a cutting motion while you rotate the bowl to combine all of the ingredients into a soft dough. Don’t be tempted to beat, your biscuits will come out tough you want all of the dry ingredients to be incorporated but not over mixed! Now take teaspoon size portions and roll into balls in your palm, place them on the baking trays with about 5cm between each one. flatten lightly your finger and then press lightly with a fork. Now each biscuit is about 5cm in diameter and ready for the oven. Place in the oven and bake for 15 minutes, checking to see that they are lightly golden. If they are very pale leave them for another 3 minutes. Remove from the oven and allow to partially cool on the tray (10 minutes), then remove and place on a wire rack to cool completely. Thats that 30 beautiful morsels. 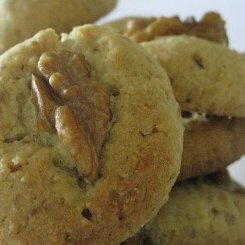 Variations: Nut biscuits, Mix 1/2 cup finely chopped pecan nuts or walnuts into the mixture before you add the flour and then place a nut on each biscuit before going into the oven. 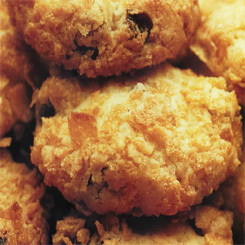 Orange biscuits: Leave out the vanilla and add 2 teaspoons of orange rind to the mixture. You can make a simple lemon icing by combining 2 cups icing sugar with 20g soft butter and tablespoon orange juice and mixing it together. If you want lemon biscuits, do the same with lemon. Cherry tops: cut a glace cherry into quarters and pop a piece on top of each one beofre going into the oven. Check the Cookie recipes section for more great cookie recipes. Take about 2 cups of cornflakes from the box and crunch them with your hands to break into smaller pieces, not powder or tiny pieces, just broken up which will be about 1 1/2 cups. Pour onto a large plate. In a bowl, add the butter and caster sugar and beat until smooth and creamy. use an electric beater. Now add the beaten egg and beat again until fully combined. Sift the flour into the mixture and add the raisins or dried fruit of your choice. Mix together with a spoon using a folding motion until uniformly combined, dont beat, just mix. Line a baking sheet with grease proof paper and take heaped teaspoons of the mixture, form a ball and roll them in the broken up cornflakes to coat well. Place them on the baking sheet and flatten slightly with your thumb. 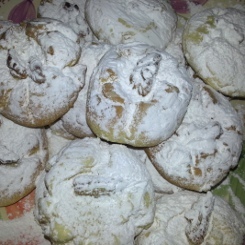 Leave about 2 or 3 cm around each cookie to allow for spreading and rising. Bake in the middle of the oven at 180 Celsius for 20 minutes until golden. To store, place a sheet of grease proof paper in the bottom of your tin or tupperware and pile them up gently. try this healthy energy bar recipe as well. 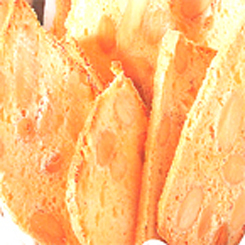 This was really great.. a simple and easy to make almond bread, that when cut very thin and placed in a moderate oven make the most amazing crispy little almond slices a bit like thin almond biscotti. Imagine melba toast that tastes of almonds. It is meant to be a bread which is also great but I prefer the crispy little fellas. Heat your oven to 180 Celsius and line the tin by greasing it very lightly and lining it with baking paper. The grease allows the baking paper to stick to the sides. Cut a piece that fits the base and then a separate piece that lines the sides. If you have raw almonds, place them on a baking tray in the oven for about 3 or 4 minutes and allow to cool. Beat the egg whites to stiff peaks and add the caster sugar gradually as if you were making meringue until the mixture is glossy , thick and all of the sugar has been dissolved. Fold in the flour and the almonds with a metal spoon. You don’t want to mix it, just gently fold it in until it is evenly spread through the mixture. Spoon it all into the tin, give it a little shake to even it out in the tin and then bake for 25 minutes. Re4move and allow to cool in the tin. Don’t be tempted to eat it hot, it must cool completely. To make the crisps, cut the loaf with a serrated knife into slices less than 5mm and pop in a 160 Celsius oiven for about 10 to 12 minutes, turning after 6 minutes or so. These are better than most biscuits you get at coffee shops and well worth the effort. Enjoy them all, and try the chocolate pecan cookie recipe as well, it’s great. These Cheese biscuits are wonderfully crumchy and quite unlike anything you will expect. They use cornflakes which give them something uniquely South African and are well worth making. They lasted less than a day and are very morish. Heat your oven to 180 Celsius and lightly butter a baking tray. To a bowl add the butter, grated cheddar and cayenne pepper. Beat with a electric beater until smooth. Sift in the flour, add the crushed corn flakes and the egg and stir until evenly distributed. Don’t use the mixer. Use a teaspoon to roll small balls and place them about 4cm apart on the baking tray. Give each one a light press with a fork and a brush with a little milk. Bake for 15 minutes until light brown. Cool on a rack and dig in. They will be crunchy and delightfully cheesy. You could also add a pinch of curry powder if you like that sort of flavour. The peanut butter cookies are great sweet cookies, try them. 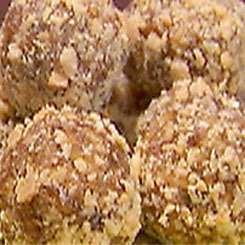 Date balls recipes have pretty much stayed the same for years. They are great to have around the house for healthier little snacks, taste great and are as simple as pie to make. With Christmas coming up make sure you have a large jar of date balls for people to snack on. Break up the Marie biscuits and give them a bit of a pounding with a rolling pin or empty wine bottle. You want a combination of fine and small pieces, this gives them a nice little crunch. 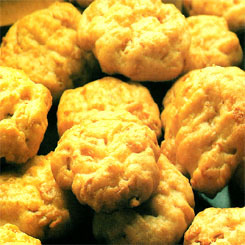 Make sure you get Bakers Maries, they are crisper biscuits and make a huge difference. In a pot over a medium heat, add the margarine and sugar. Melt it and simmer slowly until the sugar is dissolved. Add the dates and let it simmer for about 3 or 4 minutes. While the mixture is simmering, beat the eggs and add them along with the broken up Marie biscuits. Place a generous amount of the coconut onto a plate and once the mixture is cool enough to handle, roll tablespoons of the mixture into balls and then drop into the coconut to coat. That’s that, you have anytime snacks in about 20 minutes. Place them into a large jar with a lid when completely cooled to store. Try the peanut brittle recipe for a real treat. Hertzog cookies are just the best little tarts, everyone loves them. They are an apricot version of lemon meringue pie with a hint of coconut. these days you can buy frozen pastry which makes them so easy to make, you can have a dozen hertzoggies straight from the oven in about 1/2 an hour. heat your oven to 180 Celsius and spray your tart tray with spray and cook. Use a shallow tray not a muffin tray. Flour a surface and your rolling pin lightly and roll out the pastry to about 3/4mm thick. Use a glass or round cutter to cut rounds to line the tray. use a fork to prick holes in the base and then put the tray into the oven for about 10 minutes or so until the bases are lightly browned. You will be smelling that home baking smell and wondering why it has taken you so long to discover frozen pastry! Remove the tray from the oven and allow them to cook in the tray while you make the meringue mixture. Best the egg whites to stiff peaks and then add the caster sugar in 3 lots, beating well each time. Then add the vanilla essence and give it a last good beating. It should be glossy now. finally add the coconut and use a spoon or spatula to fold in the coconut, don’t beat it! 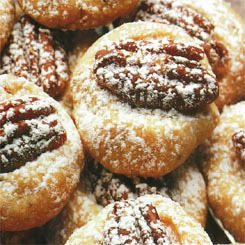 Fill each pastry case with the apricot jam to about 2/3 full and then place a nice dollop of the meringue mixture on top. Pop the tray back into the oven for about 20 minutes until the meringue is crisp and slightly browned. If you can… let them cool for a while before eating, the jam burns like hell and it allows the meringue to crisp up.